This article will cover the workflow and advantages of shooting on greenscreen for video production and how to do a simple key in post production. Greenscreen and bluescreens have become incredibly popular in the past 10 years and it is very rare that you will see a film today that hasn’t used any greenscreen footage. Also widely used in corporate video productions, music videos, adverts etc. Firstly in order to create a successful greenscreen shot or clip your footage needs to have been thoughtfully shot on greenscreen. Some of the most common problems that occur in post production with greenscreen footage are problems that happened on set. I will briefly discuss the main problems and issues to look out for when shooting on greenscreen for your video production. (For more information about on set greenscreen tips check out the shooting chroma keys article). You should usually be at least 8 feet away from screen. Try and get the screen out of focus and your subject in focus. Even lighting on your screen is very important you must try and as little variation of colour on the green/blue screen. Do not have any shadows of the subject falling onto the screen. If shooting on blue make sure your subject does not have any blue items on them otherwise they will magically vanish and vice versa with regards to shooting on a greenscreen. Also taking into consideration what your background will be so that you can light your subject correctly and also shoot it/them from the correct perspective. Never do focus pulls if you, all focus pulls and blurs must be done in post production. There are many advantages of shooting on greenscreen for your video production. It gives you freedom to make whatever is in your mind come to life on screen. Anything is possible. Often it can work out to be cheaper than building a whole lot of sets. When shooting on a greenscreen you can create any world setting for your characters, may it be an empty white space, a futuristic world etc. Most of which is done in 3D in post production, but can also be done by filming real footage and apply effects afterwards in post. It makes it possible for your characters to do anything, fly, morph, shrink, etc. if it wasn’t for greenscreens there wouldn’t be movies about super heroes. It also makes it possible for live action to interact with the CG world. Whether it be fighting off monsters or flying on a huge dragons back. Greenscreens can be useful in films, corporate videos, music videos. These are just some of the things that a greenscreen allows you to do, it really has no limits except your own imagination and skill. The first step when doing greenscreen is obviously importing it into the program of your choice; there are a number of post production programs that key green or blue screen footage. Some of which are Aftereffects, Final Cut Pro, Flint, Inferno, Flame, Nuke. 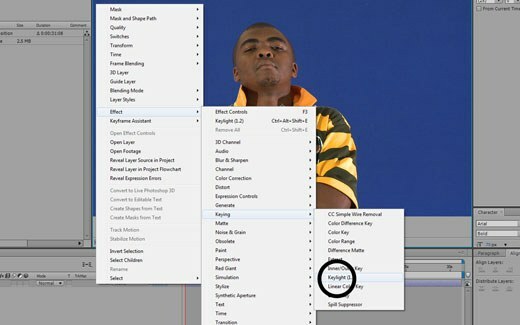 The term Key or keying is the process in which you eliminate the greenscreen or blue screen leaving behind only your subject on an alpha (transparent) layer. When you key footage you are basically selecting one pixel/one shade of colour and then the program you are using removes all the other pixels that are a similar colour. You would preferably shoot your video production on HD footage rather than DV/HDV when doing greenscreen work. Simply because it has more information and is a much cleaner image making it much easier to key out the green or the blue pixels. Create a new composition and drop your footage into the timeline. In your effects window select the colour eyedropper next to Screen colour and select a part of the bluescreen. Your green or blue background should mostly have disappeared now, select show toggle transparency button underneath your composition window. Select your view mode in your keylight effects window and where it says final result click on the tab and select screen matte. Your image should look something like the picture above. The image you want to keep should mostly be in white and your background where the screen was should be black. There is usually some white or grey spill around your character. Whatever is white will remain visible and whatever is black will disappear, grey parts of the image in your screen matte will be slightly transparent so you want to get rid of them entirely. In your keylight settings select your screen matte drop down tab. Screen gain is your tolerance, if you increase it you will remove more colours that are similar to the one you selected with the eyedropper. Clip Black will take away the white in your image as you increase it. Clip White will add white to your image as you decrease it. Screen Shrink/Grow will increase or decrease the edge thickness around your object. Screen Softness blurs edges and makes them slightly transparent. Play with these settings until your character is completely white and your background is solid black. Once you have achieved this go back to view mode in your keylight effects panel and select final result. Your subject should now be on a clean alpha layer. You should be ready to put your background behind your character now. Import your background and select it in your project files panel and drop it in the timeline underneath your greenscreen footage. Your subject often has slight edges or is not the correct colour. In your keylight settings you can select despill bias eyedropper and select your characters skin colour, this helps remove any green or blue light/spill on you character. To get rid of these edges you can use the screen shrink or grow settings in your keylight effect or you can apply a simple choker effect. effects > matte > simple choker. This effect shrinks the edges of your image; you do not need to set it very high, usually between 0.4 and 1 works quite well. Screen pre-blur in your keylight settings also helps to soften the edges of your character. To make your character fit into the background you will have to play around with his position, scale and you will need to apply some colour correction. Generally Curves, hue and saturation, brightness and contrast work well to get the colour you are looking for. Curves works with the master layer which effects all colours of your subject, or you can select R and manipulate those curves only to change the red value in your image, the same goes with G-green and B-blue and your alpha value. Hue is not really used for matching the colours of your background and your subject, but increasing your saturation will give you a more colourful image and decreasing it will make it less colourful, this often helps when trying to match your subject to the background. You can do this be going to you render queue panel. This is where all of your output settings are. Format: this drop down tab gives you options for what kind of file you would like to export such as an avi, quicktime, flash video, image sequence, etc. You can change the size of your footage under the option stretch, to do this click the check box next the word and either manually insert your values or select one of the presets. Once you have selected your output settings select ok and select output to in your render queue panel.This will show you where aftereffects is going to output your video to.